The leaking pipe along Vaturu-Nagado high pressure raw water pipeline. The Water Authority of Fiji (WAF) will be undertaking a partial water shutdown in the Western Division. Water supply will be disrupted to elevated residential areas of Lautoka City from 10pm on Thursday April 18 until 6am on Tuesday April 23. WAF general manager Customer Services and Acting General Manager Operations, Sekove Uluinayau said that WAF would be able to supply water to majority of the areas while undertaking the partial planned shutdown to allow repairs to a major leakage on the high-pressure water pipeline from the Vaturu Dam to the Nagado Water Treatment Plant. 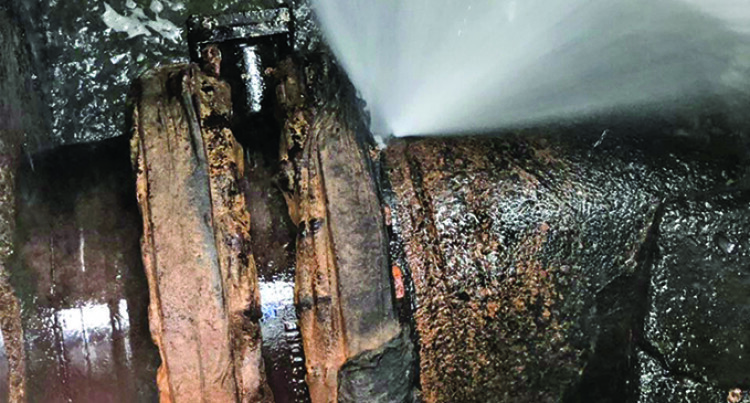 “The leakage is on the existing 711mm MSCL tee pipeline section along the Vaturu-Nagado high pressure raw water pipeline at Batiri, near the Vaturu Dam. “The leakage is suspected to be a result of burst or worn out rubber from the joiner. This is leakage loses approximately one thousand litres per day,” Mr Ulunayau said. “This leakage depicts the ageing infrastructure and WAF is working to conduct necessary upgrades to the existing water systems around the country”, Mr Uluinayau said. “For other purposes such as bathing, washing dishes and clothes, more water should be stored. “Once households run out of the water they have stored, WAF will be placing around hundred, 5200 litre and 10,000 litre water tanks at strategic locations in affected areas. In addition, the Authority will also attend to specific requests that will be made by domestic customers its water carting services,” said Mr Ulunaiyau. Mr Uluinayau said WAF will ensure that during the partial shutdown period there will be minimal interruption to the major services such as hospitals, schools and hotels as 19 water carting trucks will be deployed to cart water.